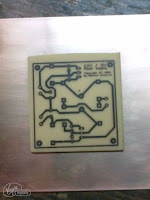 Want to fabricate printed circuit boards (PCB) at home, cheaply, quickly, and easily? So did I.
Experimentation and perseverance help. It's ok if you goof up a few times; I did. 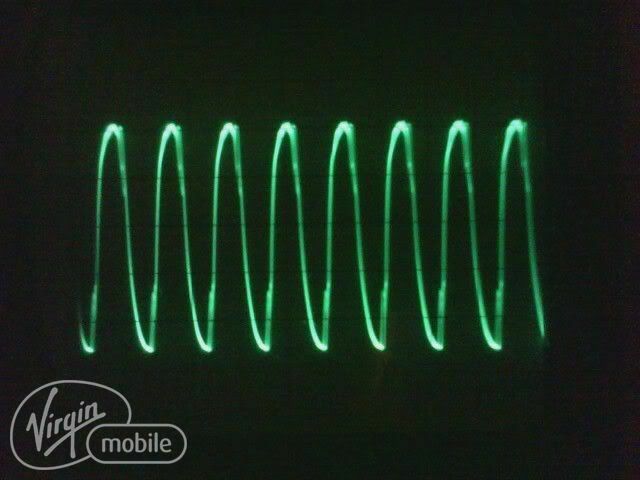 Hang in there and you'll be a DIY pcb etching guru soon! Find out what works for you, and you're set. 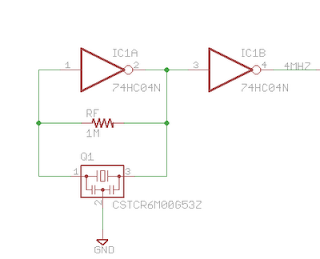 Start with a small, simple circuit and stick to single sided traces! 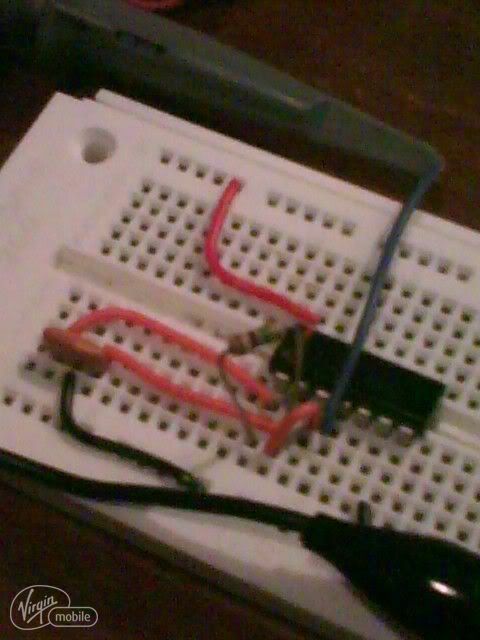 My first circuit was for a 12V/5V dual power supply circuit for another project. It uses only a handful of components. The design layout fills a 2" square area, using up only a fraction of an already cheap (under $4) PCB blank from the local Radio Shack. 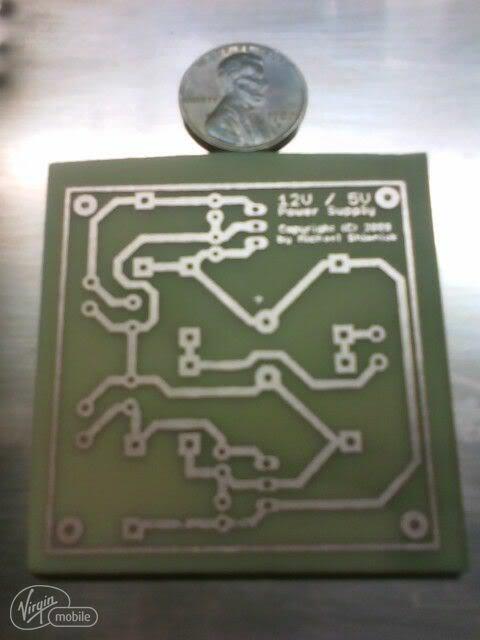 In case the etching went poorly, I had enough PCB material to try it a few more times. 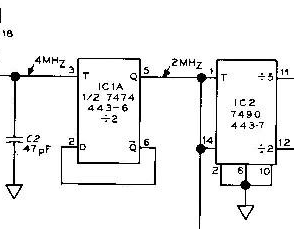 Use wirepads (search for wirepad in the Eagle libraries) or pin headers for external interfaces not appearing in the schematic, like the transformer secondary wires, in this case. Use the DRC dialog and Restring tab to change the size of pads; bigger pads are better for manual drilling. 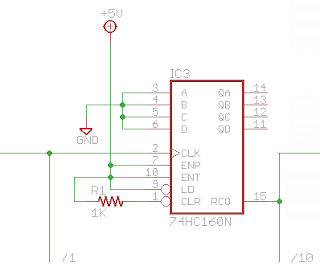 Put all traces on the bottom layer so when you print the transfer you can uncheck "mirror"
For off-board components like rotary switches, create a custom package in the Eagle library comprised only of wire pads but using the correct schematic symbol. Include dimension lines in the transfer print but make them at least 16 mil. 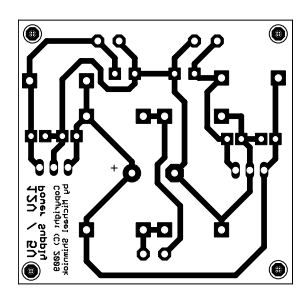 Create fill areas (pour regions) with Eagle, particularly for GND, instead of leaving lots of blank spaces on the PCB. Saves etchant and time etching. 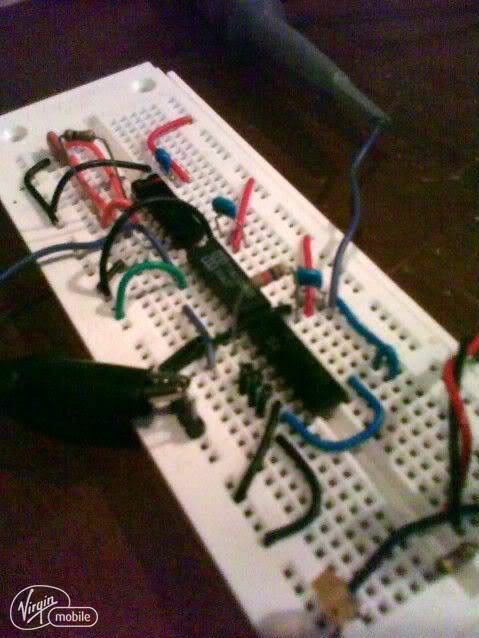 It also saves time laying out the board. Can't figure out how to fit all the traces on one side? Cheat! 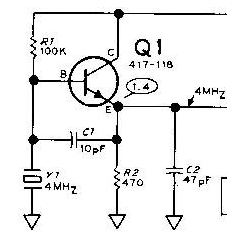 Use jumper wires as in the board above and below. Many of the consumer electronics I've taken apart use bus wire. It's quick to install since there's no insulation to strip. Jumper a trace on the "top" of the board with pads. Add two pads where you want your jumpers. Change their name to match the net you're trying to jumper (e.g., VCC). Draw traces on the bottom side (blue) to the pads. When you print the PCB (see below) hide the top layer. 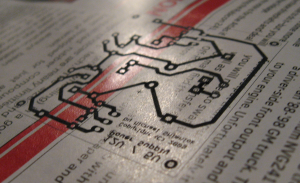 Several websites give tips on laser printing on magazine paper and transferring to the printed circuit board. Laser printing (and photocopying) uses melted plastic instead of ink. By applying heat heat, the plastic melts itself to the PCB, then the magazine paper can be soaked in water and rubbed off, leaving the laser print behind as a mask for the etching solution. 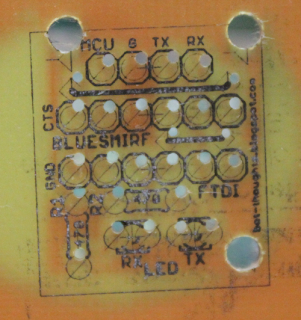 A few companies provide store bought solutions for transferring trace masks to the PCB but those are obviously more expensive than using scrap magazines. I haven't tried them yet. Ricci Bitti's website gave the best advice. Printing on magazine paper was no problem and you can easily see the matte laserprint on the material. Apply moderate pressure, and slow circular movement on the iron for about 60 seconds. 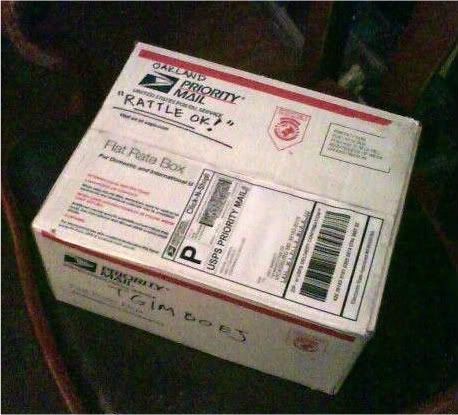 Et voila, after six or more failed attempts, I finally got a good transfer! A few of the traces are a little blotchy, but none of the pads are. The fine detail turned out beautifully. Like you can see in the picture, the tiny printing and the crosshairs in the corner drill holes retained their detail. I've since found better results when using traces no wider than 32 mil with good results at 24 and 16 mil. Smaller traces are unlikely to work well. You can repair any flaws in the transfer with a fine tip or ultra fine tip Sharpie permanent marker which conveniently resists etchant. 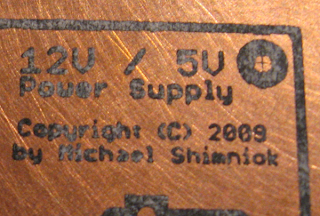 The common chemical of choice for DIY PCB etching is ferric chloride and that's what i use. 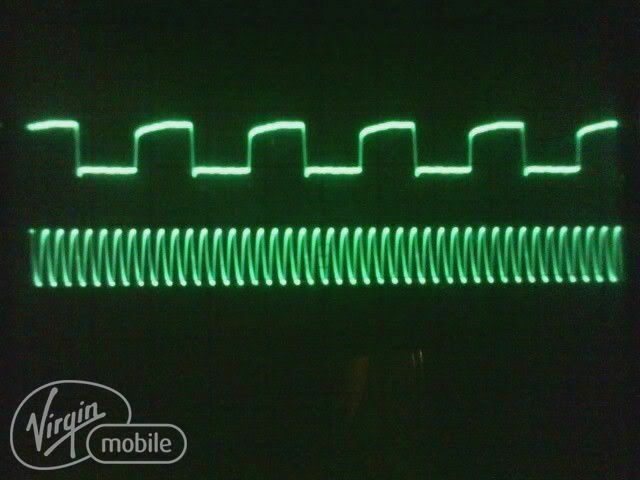 You can get it from Radio Shack . Use suitable disposable gloves to keep the FeCl off your hands. They stain everything yellow. You don't want to look like a Simpsons character. Work in a well ventilated area. To speed up pcb etching times, I now use a hot water bath. Put the FeCl in a small disposable tupperware tub. Put water in an electric skillet (I use my reflow skillet). Of course don't use it for food anymore! Put the tub in the water, and heat up the water to somewhat below the "warm" setting. Boards usually etch in about 15-30 minutes. Don't let it go too long or it'll etch through the toner. So check it after 15 minutes and ever 5 minutes after that. I no longer use the FeCl-soaked sponge method. Too messy! Once your pcb etching is complete, dip the board in water to rinse and neutralize the FeCl then wipe off the toner with acetone (spray carb cleaner) and a paper towel. 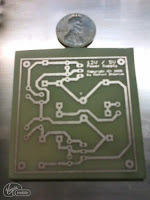 On my first fabricated board (below) the etching worked really well and even the smallest printing came out perfectly. There were a couple of small spots of toner that separated leaving tiny spots on a couple traces that were a little etched. You can do your own "silk screen" printing on the top layer, too. But without real silk screen. 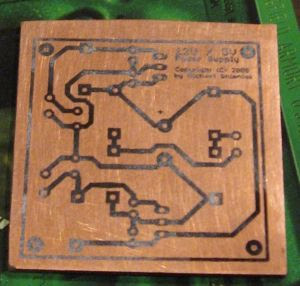 Just use the toner transfer method to transfer printing onto the top of the board to show what components go where. It's best to drill holes before you silkscreen; it gives you something to align to. Align the printed image to the board and holes. Toner transfer the image onto the blank side of the board. After fabricating many printed circuit boards over the last few years since I first wrote this article, I've been etching more surface mount boards using 16 mil traces with 0805 and 0603 size SMD components, as well as SOIC, SSOP, SOT-223, SOT-23 and 0.6mm QFP packages! Not bad for DIY, eh? Here's a couple examples that turned out very nicely. The ability to transfer such fine detail opens up a world of possibilities in board design. I used a Reflow Skillet to populate both boards. I've since started using my Weller station with fine tip along with fine SMD tweezers for the small passives. 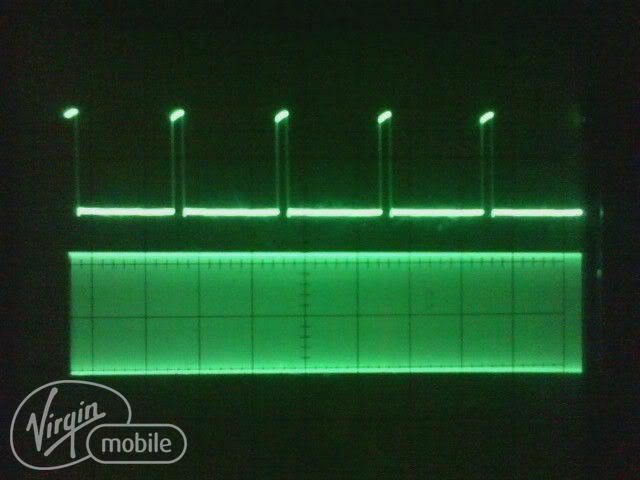 16 mil traces with 0603 SMD components. 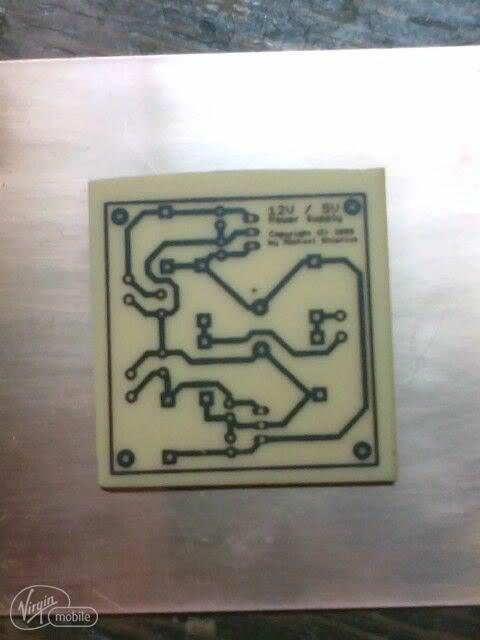 With a little experimentation and perseverance in the face of multiple failures, I was able to reliably etch my own through hole and surface mount printed circuit boards. 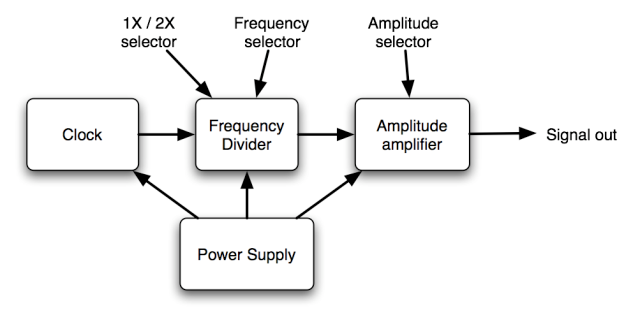 If you follow these tips, you'll soon be doing the same and a new world of hobby electronics will open itself up to you.. But hey if you got this far and still don't feel comfortable trying it, then give oshpark.com a try. I highly recommend them and use them all the time. Affordable and outstanding quality. 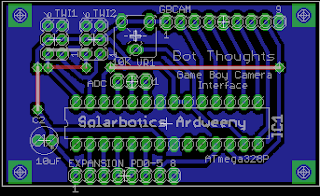 As time permits I've been tinkering on several projects, some of which I'll share in upcoming posts. Of course I'm most busy with our little one, but I fit in a little time here and there for the above. Here's another artifact from the old EIB sketchbook. I was trying to figure out how I was going to build the mechanicals for the shoulder, arm, and elbow. 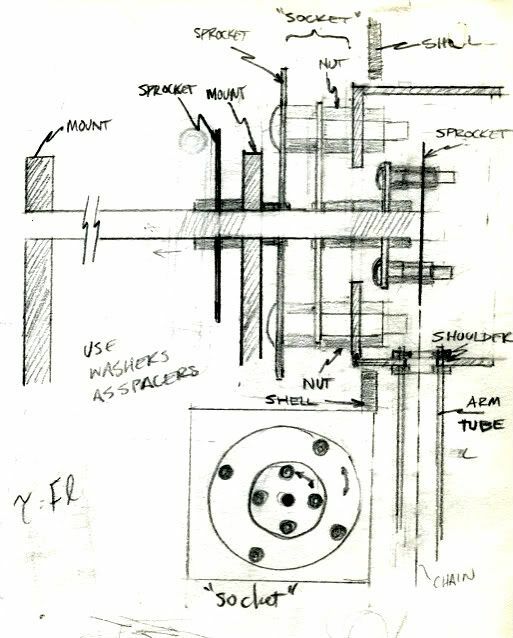 The concept is a drive sprocket for the elbow that shares the same rotational axis as the shoulder and its drive sprocket. The elbow drive sprocket in turn drives a sprocket in the elbow with the chain running through two arm parallel arm tubes. The sketch needs a little work. The shoulder's axle would have to ride on bearings, while containing bearings that support the inner elbow axle. A sprocket would be attached to each axle. Why actuate the elbow this way rather than having a motor attached to the arm itself? So all the big arm motors could sit inside the chassis instead of adding weight and bulk to the arms. And center of gravity can be kept low. Is it workable, practical? I have no idea. The way a 4x4 floating front axle works is this. The tire is bolted to the hub. The hub (67) spins on the spindle (62) by way of inner and outer wheel bearings (65, 66). These bearings bear the weight of the vehicle, which is transferred through the suspension to the axle housing, to which the spindle is attached. 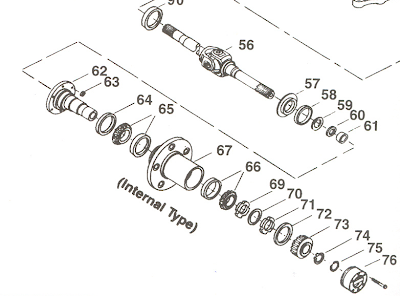 Meanwhile, the spindle is just a tube and through it runs the axle shaft (56). A bearing inside the spindle (61) supports the axle shaft. The end of the axle shaft has splines cut into it. The inner surface of the hub has splines, too. A drive flange is a puck of steel with a hole in the middle. The hole has splines and slides onto the axle shaft splines. The outer edge of the flange has splines too and those engage the hub splines. 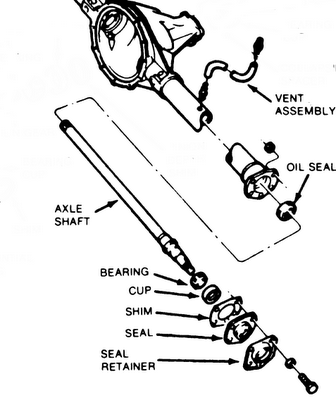 But most 4x4s use manual locking "hubs" (73-76) instead of a drive flange so that the axle shaft can be engaged with the hub & rotor assembly (67) when in 4wd and disengaged when in 2wd. Kind of an interesting concept that allows the axle tube, bearings, spindle to bear the weight of the vehicle, so that the only thing the axle shaft does is transfer torque. By contrast, in a semi-floating axle like you'd find on the rear of 1/2 ton trucks with "live" axles, the wheel bearings are pressed onto the axle shaft and ride on a race that is mounted in the axle tube. The axle shaft has a mounting flange to which the wheel is bolted. In other words, the weight is borne by both the axle tube and the axle shaft itself. This type of axle generally is able to carry less weight than a full floating axle of similar size because the axle takes on double duty. 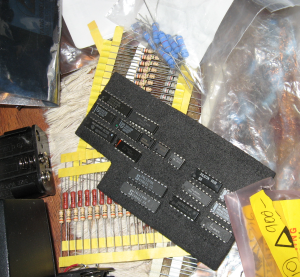 The arrival of the TGIMBOEJ was a great kick in the pants to finally organize my electronics parts. 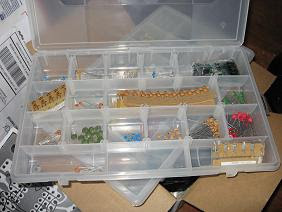 I had to find some cool gizmos to go in the box so might as well organize while I'm at it. 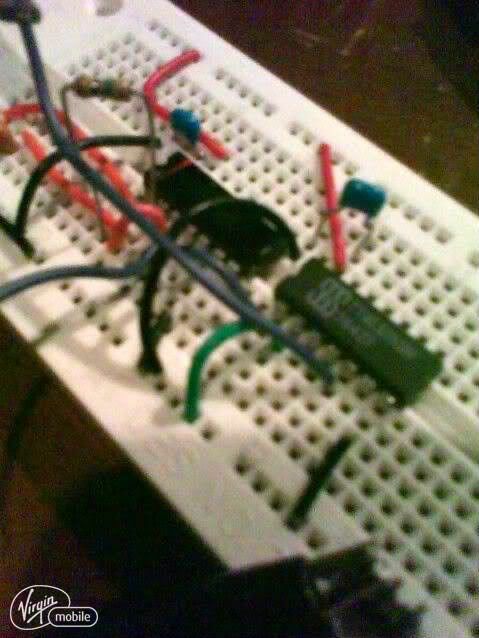 For capacitors and non-static sensitive semiconductors like BJTs, LEDs, and diodes, I used some cheap, divided containers from Home Depot. For the static-sensitive stuff, I found some nice conductive boxes at Stanley Supply Services. 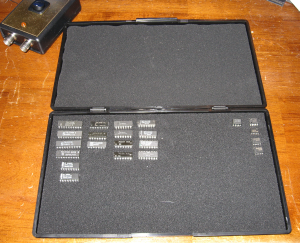 I ordered a multi-compartment container to store MOSFETs, voltage regulators, etc., and a box with conductive foam for DIP ICs. 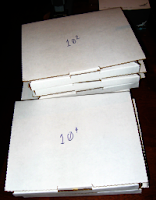 For the moment, cardboard CD mailers hold my stock of 1/4 watt resistors, sorted by order of magnitude. 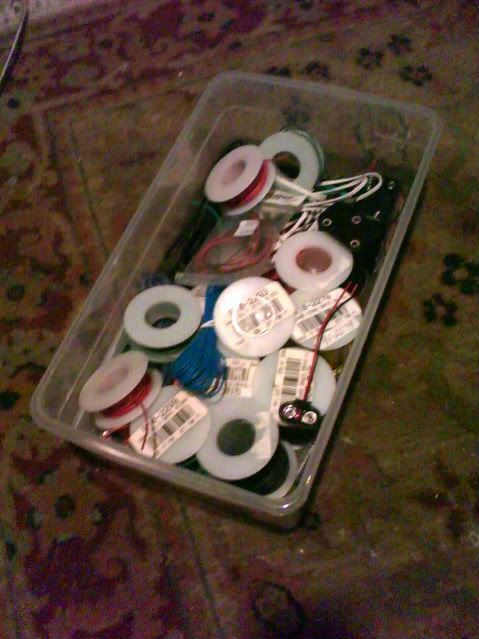 I may look into getting better organizers to make it easier to find resistors quickly. Meanwhile, ongoing projects are stored either in large used yogurt tubs (yes, they were run through the dishwasher first! yuck!) , 6"x4"x12" clear plastic containers with lids, pill containers or whatever else I can find. 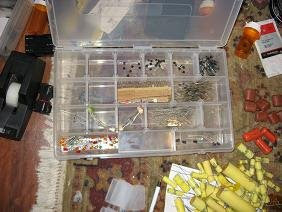 Small hardware like screws, nuts, bolts, casters, brackets, and so on will go in pill containers. Larger stuff, along with those pill containers, will go in a plastic tub. Wire and connectors are stored in one of the clear plastic tub containers. 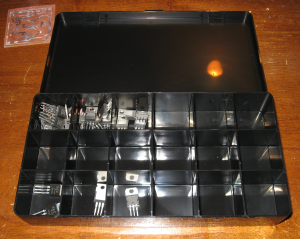 Readers, what do you use to organize your parts?